The 5th international conference on language, culture and communication will begin just after a couple of hours today March 5, 2018 at Faculty of Humanities, Bahir Dar University. Faculty of Humanities has disclosed its plan to launch undergraduate BA Degree program in Chinese Language. Dr. Dawit Amogne, dean of faculty of humanities, in the discussion held today at the faculty, has said that the program will begin in mid 2018. The Faculty of Humanities will start teaching Ge'ez in 2017/18 academic year. Dr. Dawit Amogne, Dean of the Faculty says that the curriculum for Masters in Ge'ez has been reviewed in public workshop, held in Old Senate Hall, back in October 2017. BDU:The Faculty of Humanities at Bahir Dar University has begun its first national conference on language, literature, culture and communications. 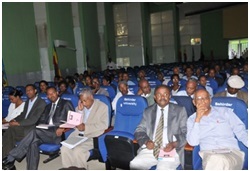 The President of Bahir Dar University Dr.Baylie Damtie made an opening remark stressing the necessity of discourse among Ethiopian intellectuals on the contemporary issues related to the field of humanities. The Chinese language teaching scheme is launched on March 24, 2014 by two Chinese instructors for twenty five teachers and seventy students, grouped into three sections. BDU: The University’s Administrative Board in its regular meeting held on 11 April, 2014 awarded professorship to one of the long-serving, 1993-present, staff in the Department of English Language and Literature, Faculty of Humanities, Dr. Abiy Yigzaw Filate who has contributed enormously both in the academic and administrative realms. 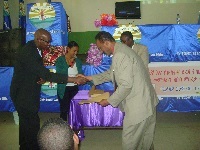 BDU: The University’s Faculty of Humanities has formally launched Amharic Language knowledge sharing Club. During the meeting, the Dean Dr Seyoum Teshome explained that the installation of the club would be instrumental to identify problems and suggest remedies hazarding the development of the language.